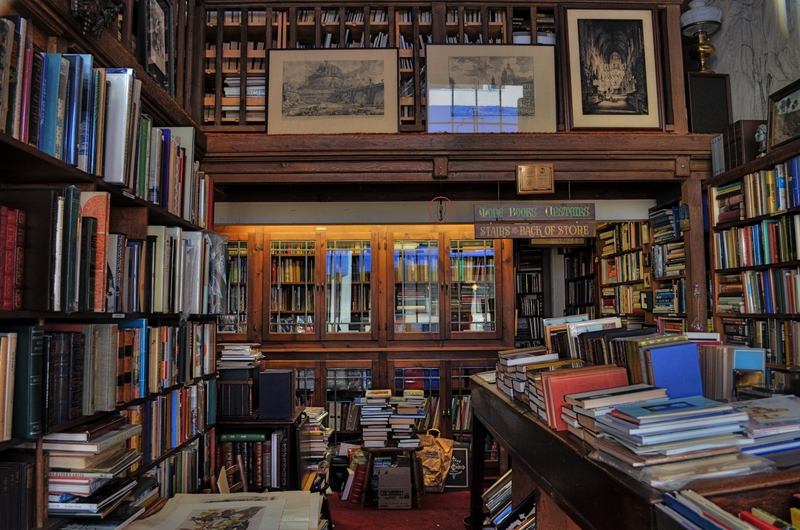 I WILL DO ANYTHING TO PHOTOGRAPH BOOKSTORES. Not the generic Costco and Wal-Mart bargain slabs laden with discounted bestsellers. Not the starched and sterile faux-library air of Barnes & Noble. I’m talking musty, dusty, crammed, chaotic collections of mismatched, timeless tomes…. “many a quaint and curious volume of forgotten lore” as Poe labeled them. I’m looking for places run by dotty old men with their glasses high on their forehead, cultural salvage yards layered in multiple stories of seemingly unrelated offerings in random stacks and precarious piles. Something doomed by progress, and beautiful in its fragility. Through the window, and into a forgotten world. A fake two-shot HDR from a single exposure at 1/80 sec., f/5, ISO 400, 18mm. In my last post, I commented that, even when your photography is rules-based….i.e., always do this, never do that, there are times when you have to shoot on impulse alone and get what you can get. It sometimes begins when you’re presented with something you’re not, but should be, looking for. A few weeks ago, I was spending the afternoon at one of Monterey, California‘s most time-honored weekly rituals..the marvelous, multi-block farmers’ market along Alvarado Street. The sheer number of vendors dictates that some of the booths spill over onto the side streets, and that’s where I found The Book Haven. The interior of the store afforded an all-in-one view of its entire sprawling inventory, but the crush of tourists bustling in and out of its teeny front door meant that any image was going to look like the casting call for The Ten Commandments. I had to come back, when both the store and I were alone. With the limited amount of time I had in town, that meant that I would have to stroll by just hours ahead of my plane for home. Heading out at 8:30 in the morning, I had obviously solved the problem of “too many people in the picture”, but I had traded that hassle for a new one: the store would not be open for another three hours. For the second time in a week (see “Look Through Any Window, Part One”) I was forced to shoot through a window, but at least there was enough light inside to illuminate nearly all of the store’s interior. To avoid a reflection, I would have to cram my lens right up against the glass. Once my autofocus stopped fidgeting, I could only obtain the framing I wanted by shooting through a narrow open place on the center of the front door, standing on tiptoe to hold the composition. I also had to keep the ISO dialed low enough to not create extra noise, but high enough so I could take a fairly fast handheld exposure and get as much detail from the dark corners as possible. Balancing act. In viewing the image later, I saw that there wasn’t enough detail to suit me, either in the individual books or the darker spaces around the store, so I pulled a small cheat. Making a copy of the shot, I pulled down the contrast, boosted the exposure, and sucked out some shadow, then loaded both shots into Photomatix, fooling the HDR program into thinking they were two separate exposures. Photomatix is also a detail enhancer program, so I could add sharper textures to the books and a richer range of tones than were seen in the original through-the-window shot. Hey, you can’t have it all, but, by at least trying, you get more than nothing. This entry was posted on November 14, 2012 by Michael Perkins. It was filed under California, Composition, darkness, Exposure, HDR, ISO, Light, low light, Monterey Bay, Still Life, Textures and was tagged with Bookstores, Hand-Held, International Organization for Standardization, low light, Monterey California, Photomatix, Window.